Brother Lawrence Bradford (May 24, 1939 – September 15, 2015.) died peacefully on Tuesday, September 15, the Feast of Our Lady of Sorrows, surrounded by monks and friends, fortified by the Sacraments of the Church, and having received the Apostolic Pardon. Larry Glenn Bradford was born on May 24, 1939, the son of Harold and Aurice (Groom) Bradford in Atlanta, Kan. He attended elementary school at a number of places throughout Kansas, and graduated from Palco High School, Palco, Kan., in 1957. After completing a Bachelor’s degree at the University of Kansas in 1961, where he was received into the Catholic Church, he came to St. Benedict’s College to study in the seminary on the Hilltop (located in St. Benedict’s Hall) for one year. In 1962 he entered the novitiate at the Abbey, but withdrew shortly. He would come back one year later to begin the novitiate again, profess first vows, and go on to study theology for two years in the Abbey's Theology School, but left before professing solemn vows. He received a Master’s Degree in teaching from Northwestern University in 1970 and began teaching at the high school level. A call to find Christ in community would continue to attract Br. Lawrence’s heart, and in 1978 he again returned to the Abbey to begin a novitiate. This time he stayed, professing his First Vows on August 15, 1979, and Solemn Vows on August 15, 1982. 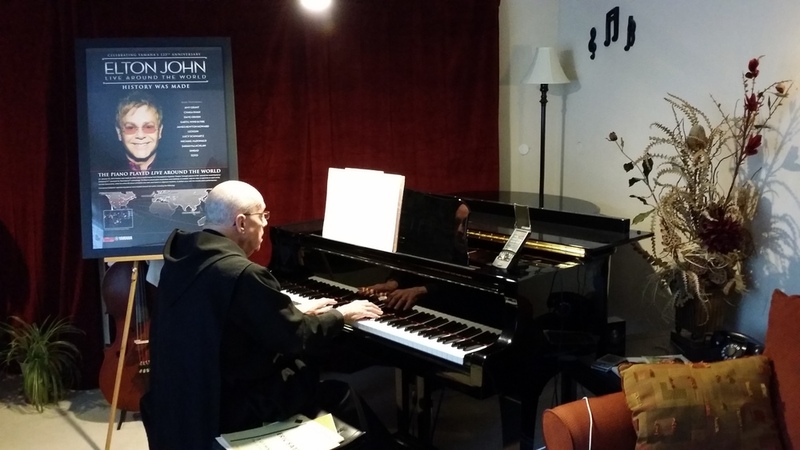 While in first vows he taught mathematics and science at Maur Hill Prep, and served as Assistant Organist and Sacristan for the Abbey liturgies. Upon professing Solemn Vows he began doctoral studies in microbiology at the University of Kansas, completing that degree in 1989. While at KU he also helped as organist at the St. Lawrence Catholic Center. In addition to serving as a professor of microbiology at Benedictine College, Br. Lawrence was Kitchen Master and continued as Assistant Organist of the Abbey. He was faithful to prayer and the common life. He loved to cook for the monks and guests, and for a time belonged to a gourmet cooking club in Atchison made up of professors of the college and other friends. He relished conversations with monks at social gatherings, with colleagues and students in the college, and with family and visitors. He was a popular figure on campus. In his love for the arts and the sciences Br. Lawrence was a true renaissance man. He enjoyed going to lectures and concerts on campus and in the area. One of his favorite books that he often encouraged young monks to read was Leclercq’s The Love of Learning and the Desire for God. A Study of Monastic Culture. In the 1980s Br. Lawrence was active with Father Robert Brungs, S.J., Ph.D., a physicist who directed The Institute for Theological Encounter with Science and Technology. Brother Lawrence was preceded in death by his parents, Harold and Aurice. He is survived by the monks of the Abbey, two sisters, Karen Lee (Arthur), Salina, Kan., and Shirley Ruda (Kenneth), Atwood, Kan., and one brother, Harold Bradford, San Simon, Ariz.; nieces and nephews, and numerous colleagues and friends. Vespers for the Dead, followed by visitation, will be prayed on Monday, September 21, at 7:00 p.m. in St. Benedict's Abbey Church. The Mass of Christian Burial for Brother Lawrence will be celebrated in St. Benedict’s Abbey Church on Tuesday, September 22, at 10:30 a.m., with interment following in the Abbey cemetery. Memorials in honor of Brother Lawrence may be made by clicking here or may be sent to St. Benedict’s Abbey, 1020 N. Second St., Atchison, KS 66002. We commend our brother, Brother Lawrence, to your prayers.